To say that cooking was once a competition in our household would be an understatement. When we first moved in together, cooking with each other seemed so natural…and fun…and something we both really looked forward to….but then, our competitive natures took hold! Don’t get me wrong, it was still fun….but somehow a relaxing night of making homemade pizza or scampi or filet turned into, “Who Can Do It Best? !” After a few months of trying to out-do each other, we agreed that perhaps there WERE somethings that I made better…and somethings he had perfected. Needless to say, I took over my favorites, he took the reigns on his, and some we continue to team-up on (for example, homemade spaghetti and meatballs…now that REQUIRES team effort!). With my parents coming into town for Mother’s Day weekend, we knew Ryan’s Filet had to be included on the menu. Dad always says it is better than any steak he’s had a restaurant…we’re not sure if that is true, but it is tender and tasty! 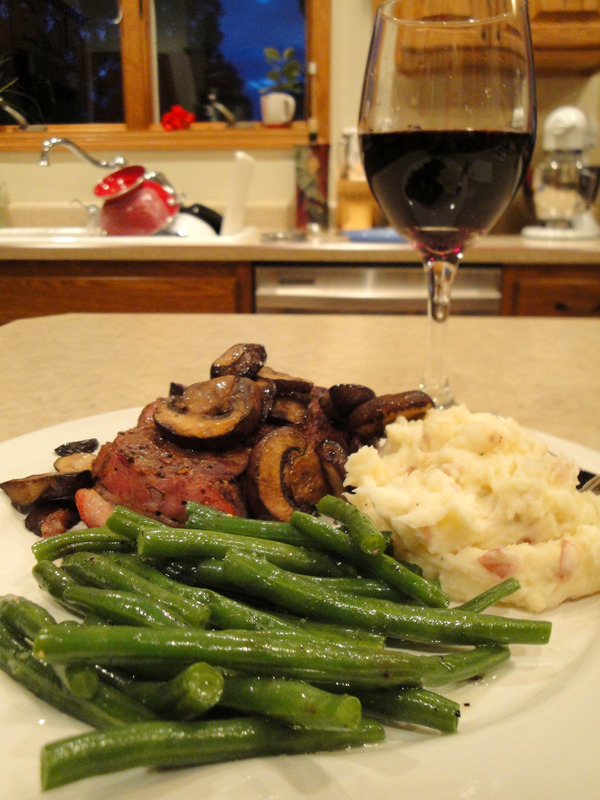 To begin this meal, start by prepping all of your green beans, red potatoes, garlic, romano cheese, and baby bella mushrooms. 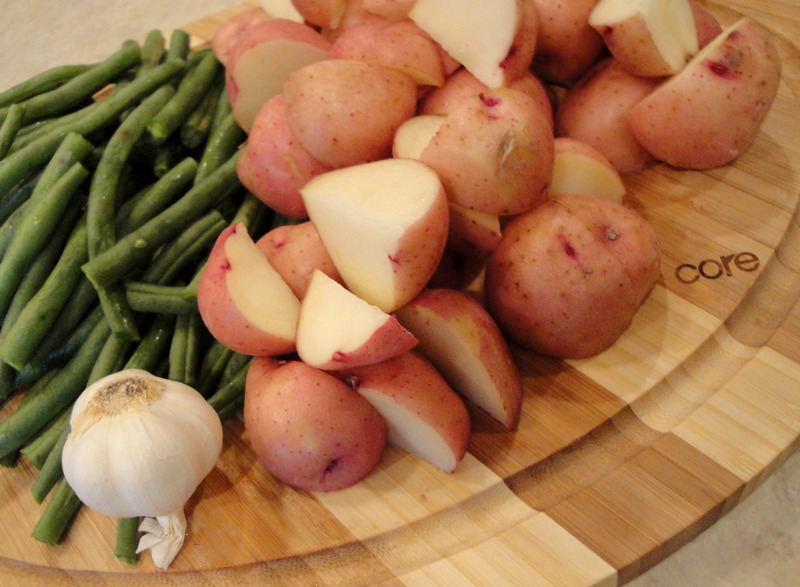 The ends of the green beans should be trimmed, the red potatoes should be quartered with a pot of water boiling, the garlic minced, the mushrooms sliced, and the romano cheese freshly grated. Once these items are sliced, grated, minced or whatever need be, the rest of the prepartion comes together in a snap! 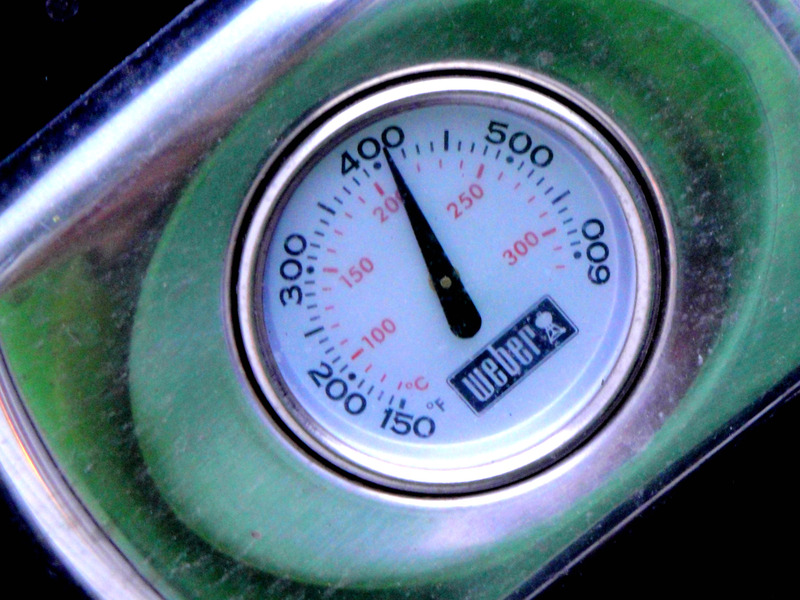 Next, preheat the grill to 400 degrees. As the grill heats up, pat each side of your filets (should be at room temp), with a thin coat of Extra Virgin Olive Oil. 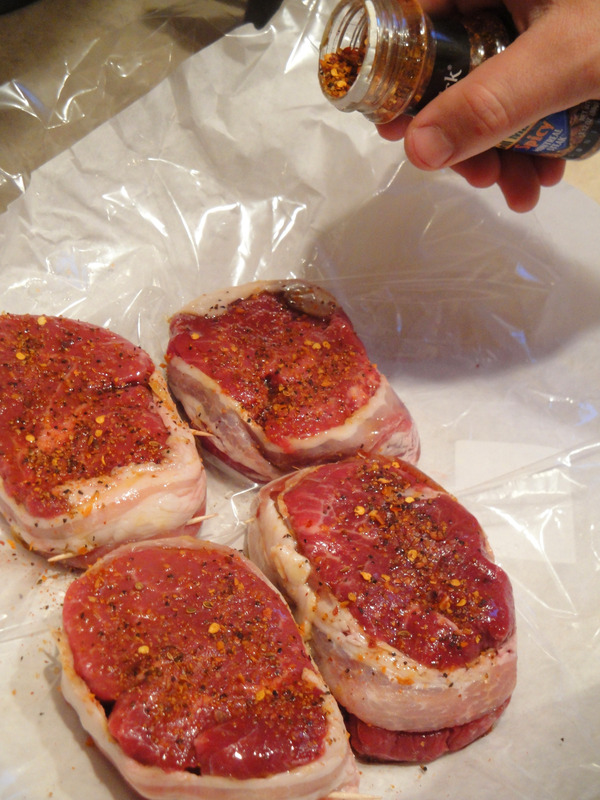 Sprinkle Montreal Steak Seasoning (to your liking) on each side. 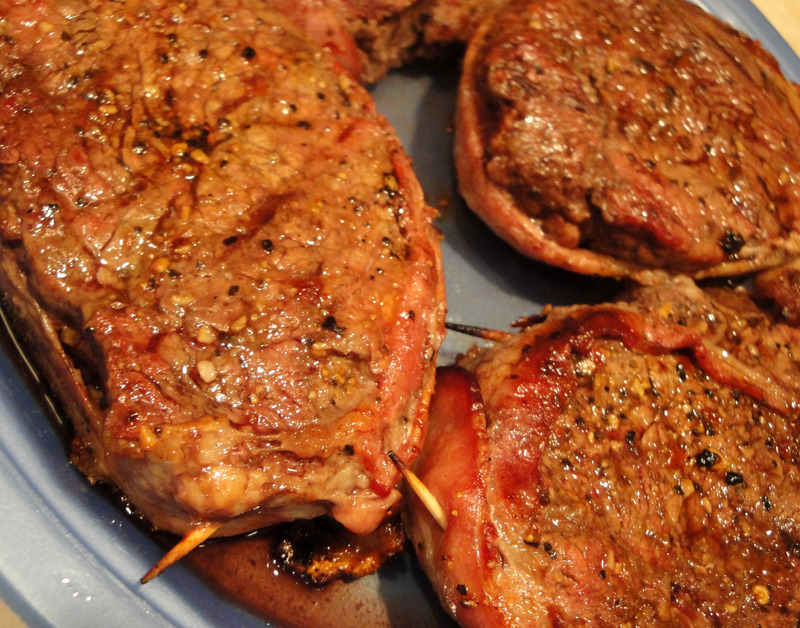 Depending on the thickness of the filets and the “done-ness” you prefer, cooking times will vary. Ryan and I both prefer our steaks done medium so Ryan starts the filets on the bottom rack of the grill for ~5-6 minutes per side. This allows the edges, top, and bottom of the steak to brown & sear in some grill marks for presentation! 😉 He then moves each filet to the upper rack for another ~2-3 minutes per side. This cooks the filets through to the center…leaving it slightly pink…or medium. 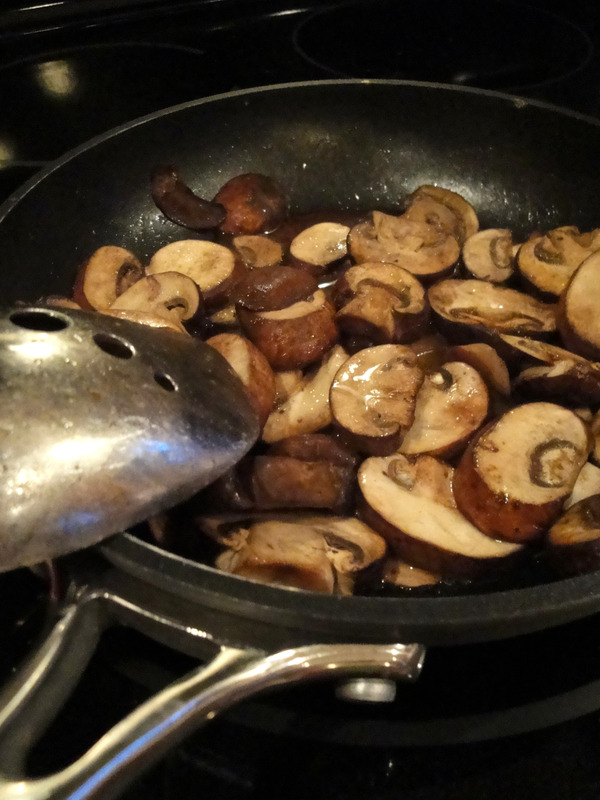 In a small pan, begin to sautee the baby bella mushrooms over low heat. 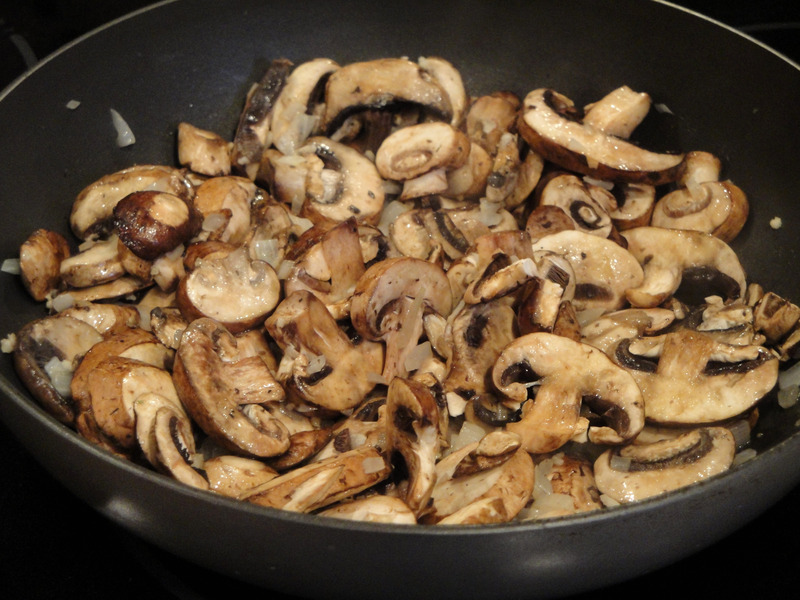 Add 1 tablespoon butter (or margarine) and 8 oz sliced mushrooms. Once the mushrooms have begun to brown, add a couple splashes of white wine (~2 tablespoons) and continue to sautee until liquid has evaporated. I generally leave the mushrooms on low heat on the stovetop until ready to serve. Boil potatoes until soft (~12 minutes) or just until the red skin is starting to seperate from the potatoes. Drain. Immediately put potatoes back into warm pot and add cheese, butter, garlic, salt and pepper, and milk. With a hand mixer, beat until smooth and fluffy. Using a spatula, move mashed potatoes to a microwave safe bowl and cover. Reheat for 45 – 60 seconds just before serving. 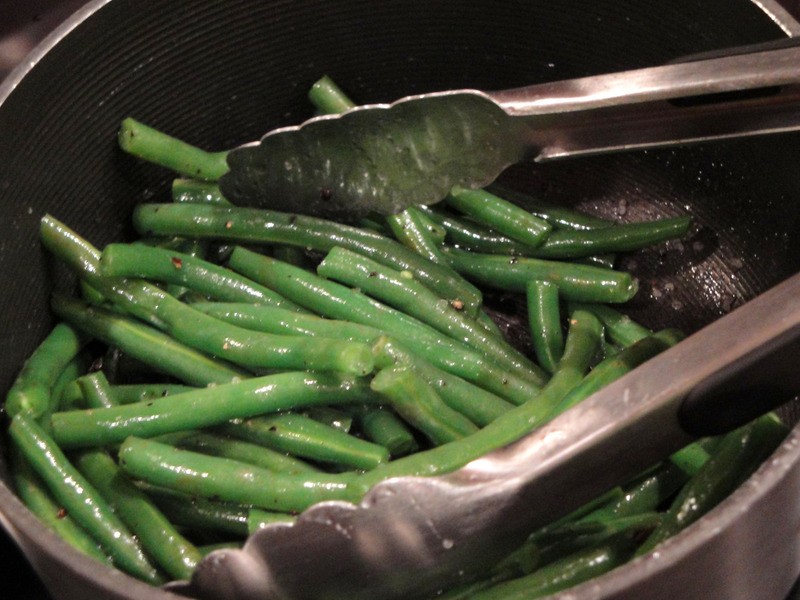 And last but not least, prepare the green beans. Bring water to a high boil. Add beans and boil for 3-4 minutes (we prefer ’em crunchy!). Drain. Pour 1 tbsp EVOO into pot (should still be warm from boiling). Add beans, salt, and pepper. Toss until evenly covered. At this point, your steaks should be done, mushrooms warming on the stove, mashed taters reheating in the microwave (if need be), and green beans ready to plate! Add a glass of Zinfandel, Malbec or your favorite Red and dinner is served! 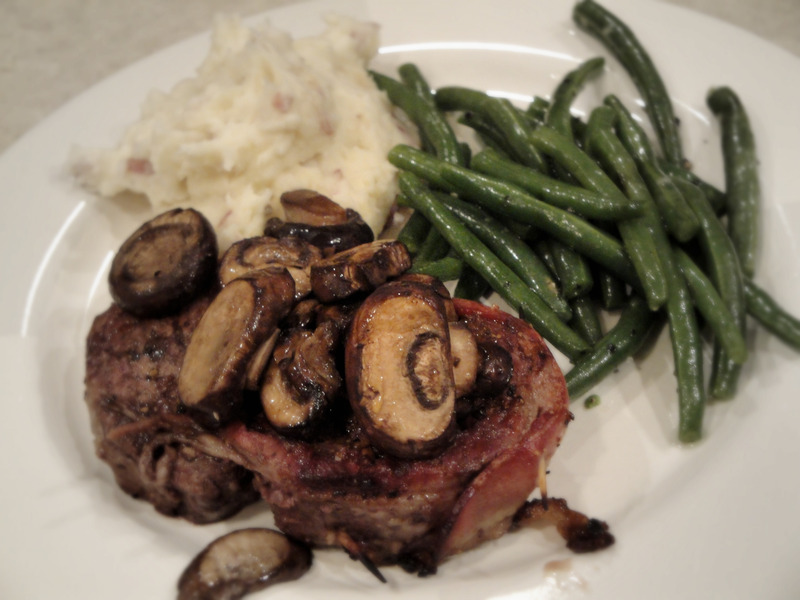 Just another one of our favorite meals….one we treat ourselves to just a few times a month. Mmmm…with a juicy filet, Ryan would argue it is perfect without A1…I, on the otherhand, can’t pass up the savory flavor on the side of my plate. Whichever way you like it…ENJOY! Happy Mother’s Day to all the Moms out there. I hope you all enjoyed your day yesterday! 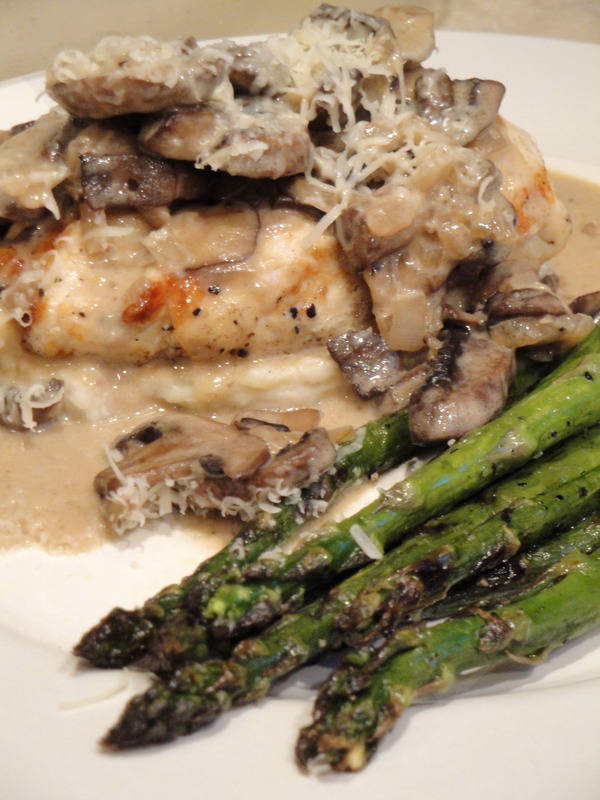 For now, let’s start with our Mother’s Day meal: Chicken Marsala with Grilled Asparagus and Romano-Garlic Mashed Potatoes. 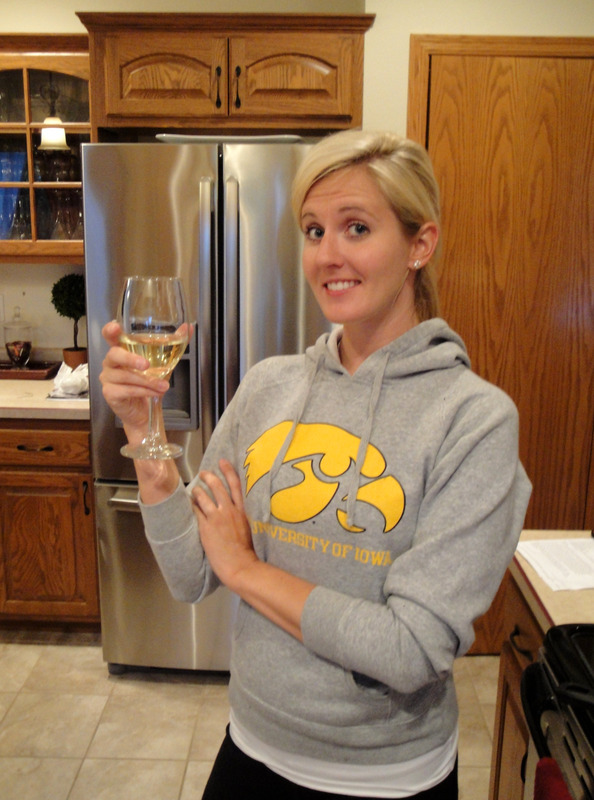 I have made this meal several times before….and it is always a hit. Start by making the mashed taters…it’s easiest to get these out of the way and reheat when the rest of the meal is complete. 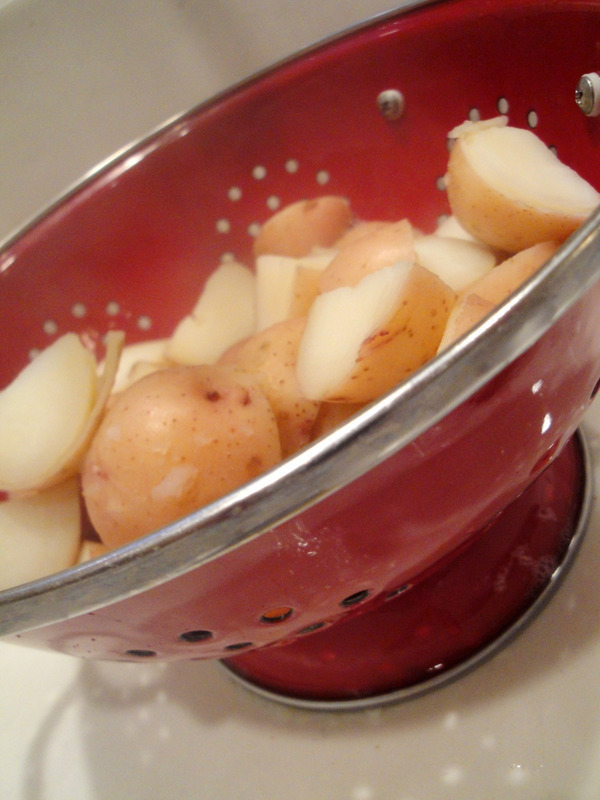 Boil potatoes until soft (~12 minutes) or just until the red skin is starting to seperate from the potatoes. Drain. Immediately put potatoes back into warm pot and add cheese, butter, garlic, salt and pepper, and milk. With a hand mixer, beat until smooth and fluffy. Using a spatula, move mashed potatoes to a microwave safe bowl and cover. Reheat for 45 – 60 seconds just before serving. Next, prep the chicken and asparagues for grilling. 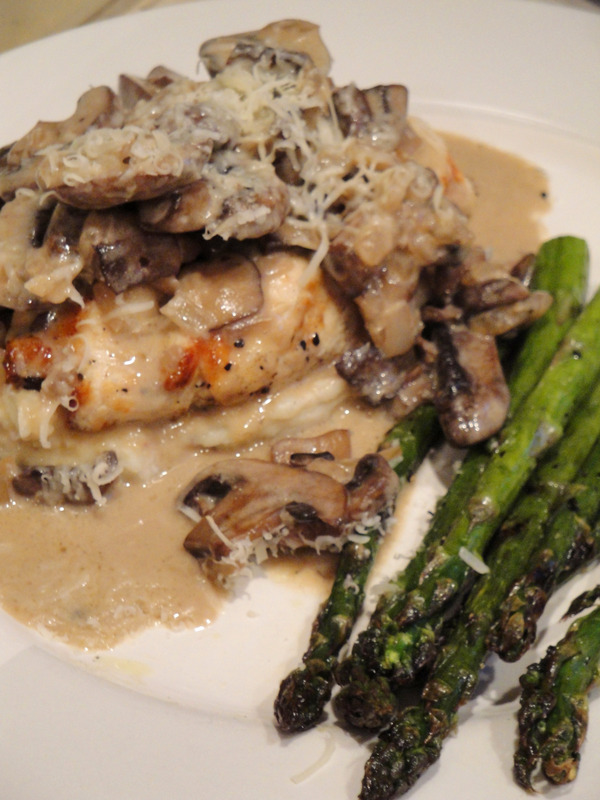 Bring the chicken breasts (called for in Marsala recipe below) to room temp and trim excess fat. Lightly brush on Extra Light Olive Oil and sprinkle with salt and pepper. Preheat grill to 400 degrees. Once you have trimmed the bottom inch off of the asapargus, drizzle with EVOO and add Kosher Salt & Pepper. Toss with tongs until covered evenly. Once the grill has preheated to 400 degrees, place the aspargus on the top rack of the grill and the chicken, evenly spaced, on the bottom rack. And average sized chicken breast should cook for ~6-7 minutes a side. The asparagus can be flipped about the same time as the chicken. Remove from the grill when slightly blackened and tender. Cover with lid or tin foil until the rest of the meal is complete. 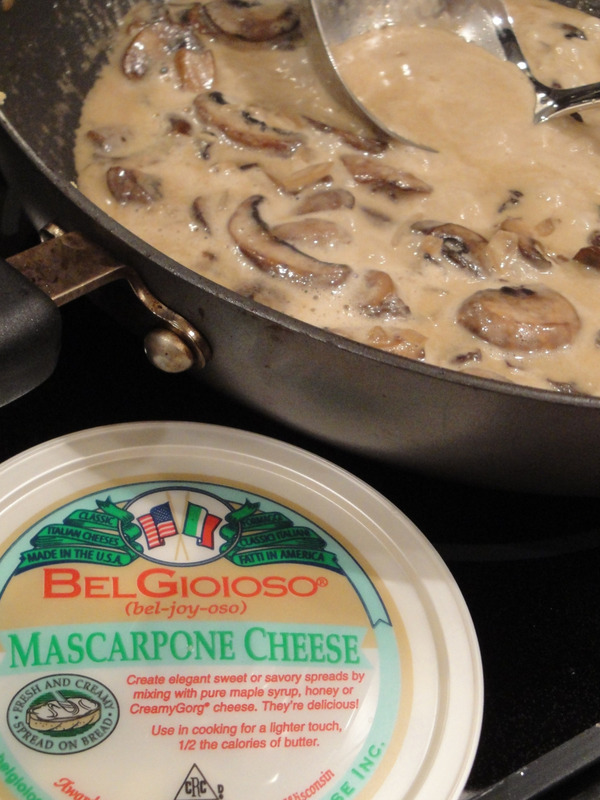 While the chicken and asparagus are grilling, prepare the Marsala-Mascarpone sauce. Melt 2 tablespoons of butter in a large skillet over medium-high heat, add the onion and saute until tender, ~2 minutes. Add the mushrooms and garlic and saute until the mushrooms are tender and the juices evaporate, ~12 minutes. Add the marsala cooking wine and simmer until it is reduced by half, ~4 minutes. Stir in the mascarpone. Simmer, uncovered, over medium-low heat until the sauce thickens slightly, ~2 minutes. 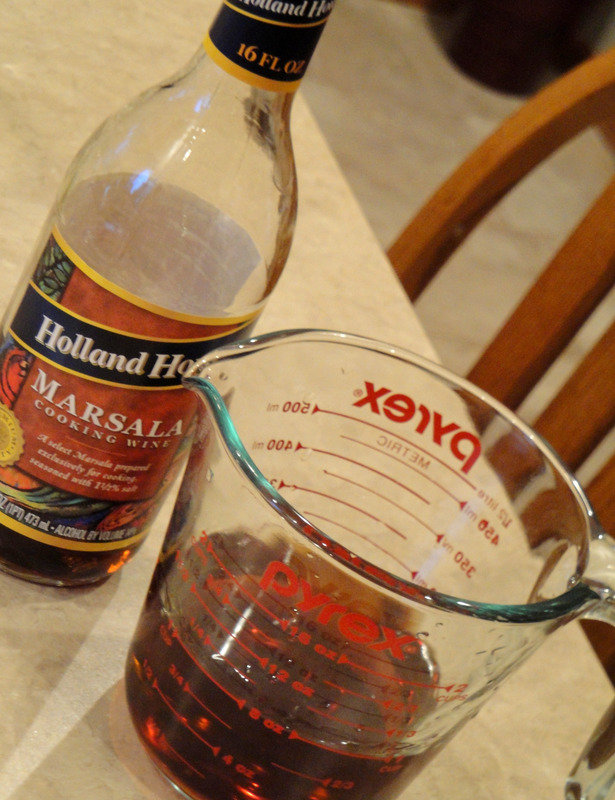 Once the sauce is complete and the chicken is grilled to perfection, you are ready to plate your Chicken Marsala! Divide the asapargus evenly among the plates. With a large serving spoon, place a scoop of mashed potatoes on the plate and top with one grilled chicken breast and Marsala sauce. Sprinkle freshly grated Romano cheese on top. Mothers hold their children’s hands for a short while, but their hearts forever. ~Unknown. I love you Mom. I hope you enjoyed your Mother’s Day. I was blessed to share it with you.